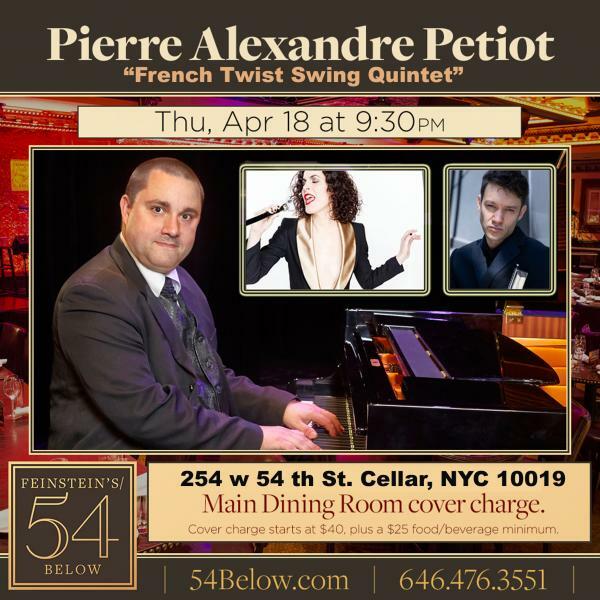 EINSTEIN’S/54 BELOW, Broadway’s Supper Club, presents the French Twist Swing Quintet (by the French Pianist Pierre-Alexandre PETIOT) at Feinstein’s/ 54 Below, for a superb musical performance of French jazz songs made popular by French composers such Yves Montand, Charles Trenet, and American Jazz Standards. The music of the French Twist Swing Quintet is inspired by the Parisian Jazz scene of the 1930s and 50s, especially by the Hot Club de France, founded by Django Reinhardt and Stéphane Grappelli. In addition to these classics, the ambassadors of Parisian hot Jazz will also perform original music, offering their own vision of what contemporary swing can be, blending their francophone culture into their American experience. Pierre Alexandre Petiot, had the privilege of playing the piano for Charles Aznavour and famous artists in Europe, with rising star jazz singer, Chloe Perrier, will bring the torrents of lyrics in Menilmontant to life with the bittersweetness but also the informed gravitas of a Parisienne who’s been there, and a special Guest, the world renowned French harmonica player Yvonnick Prené. Line Up : Pierre-Alexandre PETIOT : Bandleader and Piano, Chloé PERRIER : Singer, Yvonnick PRENE : Harmonica, Jim Robertson : Bass and Rodrigo RECABARREN : Drums .